1977 Born in Toyama City,Toyama Prefecture,japan. 2000 Graduated from Kinki University,Faculty of Literature,Arts and Cultural Studies. 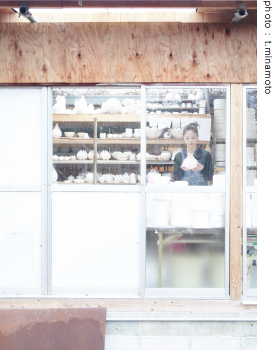 2003 Graduated from the Tajimi City Pottery Design and Technical Center. Became independent after working briefly as a designer at a Mino pottery. 2005 Receives The Special Judges Award Shigeru Uchida,at International Ceramics Festival ’05 MIno,Japan. 2007 Accepted for The 4th World Ceramic Biennale 2007 Korea. 2007 Receives The Encouragement Prize,at Craft Competition in Takaoka,japan. 2010 Moves to Sanda City,Hyogo Prefecture.